Interview: DU alumnus Dr. Kiran Bedi says, "I am still a student"
Law graduate from Faculty of Law (Delhi University), Dr. Kiran Bedi was the first woman IPS officer to join the police force. 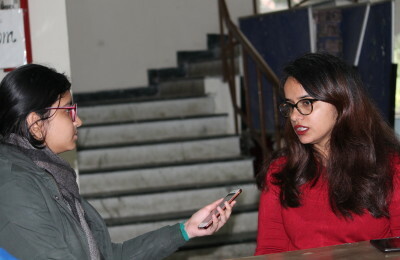 In conversation with our correspondent, the former national tennis champion talks about her journey from being a student to a lecturer and then serving the police force before finally taking on to the social sector. Anchor of the famous Indian television show, Aap Ki Kachehri, Dr Kiran also expresses her distaste for politics and strives to serve the poor and underprivileged throughout her life. Iresh: Hello Dr. Kiran! As the first woman IPS officer, tell us about what galvanized you or inspired you to take up policing? Dr. Kiran: Hi Iresh! I guess the force that attracted me towards policing was my sensitivity to injustice and related issues. Also, I was a very patriotic person, a person who would get goose-pimples and cry while singing the national anthem. Moreover, I was a cop at the age of 14 as an NCC cadet. Till the age of 18, I wore a uniform everyday for my NCC parade. I was already into the system of uniform, a life that is very difficult and organized, yet enjoyable. I became a police officer to experience this joy every day. Iresh: But the era of 50s-60s was not an era for girls. So were your parents also keen to see you in that uniform? Dr. Kiran: I am a product of my parents. I was not like an isolated rose. I was part of the garden where my parents were the gardeners. In those days of 50s and 60s, my three sisters and me had carved a niche for ourselves because our parents were continuously nutritioning us. Iresh: Were you not scared of the risks involved? You also then planned to pursue law after taking charge as the police officer. How did this come up? Dr. Kiran: My parents brought me up to take risks. They did not make ship for the harbour; they made ship for the sea (smiles). Law was something I wanted to do because it was strengthening my own way of serving. I could not join morning classes so I joined evening classes in Delhi University and combined my subject with my profession. In addition, studying law being a police officer was so interesting because I knew the application of law, all I had to understand is section of law. Iresh: You pursued law from Faculty of Law, Delhi University. Would you like to share with us your memories as a student? Dr. Kiran: The fact is that I am still a student. You cannot be anything but a student all your life. I read a lot, I write regularly and I constantly research. Education leaves hunger for knowledge. I will be a student for rest of my life. As far as Delhi University is concerned, I have great fond memories. I am still associated with the place as I often go back to talk in colleges and share my experiences. Iresh: A few days back you visited LSR for a session by NSS. Tell us about your experience there. Dr. Kiran: It was a very detailed session. I had a good time answering the questions. The best part was that they asked great questions on the topic “Women Safety and Security”. We discussed matters like dressing, different treatment of brothers and sisters at home and everyday issues like the ones faced in metros. I am glad that I was there. I was an experience for life. Iresh: Relative to your session yesterday, tell us why do you think girls still are ambivalent about coming to Delhi for studies or jobs? Dr. Kiran: Parents I feel hold back girls, wherein they should hold back boys. Girls have all the right to do everything. They feel unsafe because it is in their minds as well. There has to be reorientation of their own mind, attitude and belief. They need to speak and tell everyone that they are not weak; it is someone else who is immature and doing all this. At the same time, they need to take proper precautions and they need to understand that if parents are stopping them to wear certain kind of clothes, it is not because they want to restrict them or because of their gender, it is because they want to protect them. Kiran Bedi invites summer and winter internships for both her foundations – Navjyoti India Foundation and India Vision Foundation for community work, rural and social work, prison assignments, journalism, IT and education. To connect and apply click here. Iresh: Would you like to tell us about your current projects and activities? Dr. Kiran: Iresh, I have lots of things going but what takes away the chunk of my time are my two foundations called Navjyoti India Foundation and India Vision Foundation which are some 26 and 20 years old respectively. We have trained and qualified social workers, teachers and councillors who have been running these schools for the poor training them to do entrepreneurship, business development, career orientation and skills development. We have thousands tenth and twelfth class students whom we do not let drop out of studies. Instead, we go by their skills and enable them. So I been mentoring these two young adults for long now and we also work with villages, prisons, slums, women and children for community development and social empowerment. Iresh: In the end, tell us on how do you look back at your journey today? Dr. Kiran: If I look at my journey, I would say that I have not wasted a day. It has been a life of huge personal achievements. It is without having lost a day and getting progressive with time. Every day has been a preparation for the next day. There has never been a pressure of winning or losing, it is just about doing it the right way. It has been a journey for a better tomorrow (smiles). Iresh: Thank you Dr. Kiran. It was great talking to you. DU Beat wishes you all the best for both your foundations and all the projects in the near future. Dr. Kiran: Thank you Iresh. It was nice talking to you as well.